TUSCANY, ITALY — There’s a saying, “a picture is worth a thousand words” and at Montemaggio’s scenic winery in Radda, Chianti, the old adage rings true. However, in today’s fast-paced social media world, we might need to update that expression to “a video is worth a thousand words”. To best showcase our beloved Chianti winery and the world of Fattoria di Montemaggio, we decided to create visual wine tour of our vineyards, tasting rooms, processing areas, bodegas, seasons, harvesting time, estate magic and more. It’s a taste of what our visitors experience and it’s a glimpse at the very best we have to offer. Montemaggio soul and brand identity. In honor of our YouTube launch (watch it here), our owner Valeria Zavadnikova sat down for a few questions about Montemaggio and the magic of winemaking in the Chianti region. 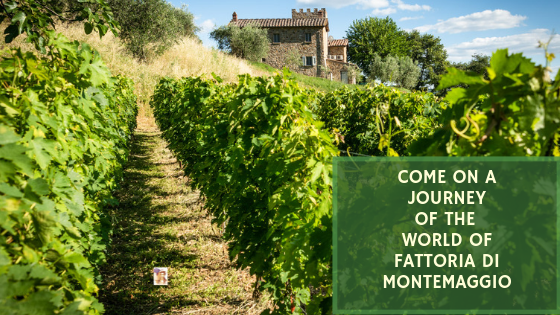 1) What about Fattoria di Montemaggio winery led you to create a video? It was my longtime dream to make a video for Fattoria di Montemaggio. First, because we take many pictures and talk a lot about the winery but there is nothing as powerful as one video that combines all of it together in one place. It sends an important message about our identity as winemakers and about our philosophy! On top of it all, there are many people who have never heard of Fattoria di Montemaggio or have never been to Tuscany or Italy even. Our winery’s video will give them a much clearer idea in their heads and show them what we really are. 2) Many local wineries have also created their own videos. How did you want Montemaggio’s to be different? That is true, there are a lot of various videos out there but they all have the same feeling – at least I have the same feeling about them – mostly that they are very traditional. They show the winery and vineyards, the owner speaks about his/her winery and its history, how his/her family or long distance relative came about to enter the business of winemaking and so on and so forth. They show the estate, the cellar, the harvest, of course, and the product. That is all there is really to it most of the time. Nobody shows the people that work there that keep the winery running, only marginally. Nobody shows the real beauty of Tuscany in each of its seasons. There is something utterly magical about the whole world of wine and everything that surrounds it and it deserves to be shared. Last, everyone talks a lot, when the real beauty of the winemaking process just needs to be shown. 3) The theme of the video is Radda in Chianti’s four seasons which are highlighted throughout the video; can you go more into detail about how it has been linked to the question of culture, tradition, terroir, etc at Montemaggio? Nature does not have bad weather, it is always stunning and it was important for me to show this. Then, there is an idea of the natural circle of life – everything has a beginning and an end, it is not bad or good, it is life itself. I have tried to insert bits and pieces that show how we should enjoy nature and preserve it, how we should cherish every single minute of every single day, like children who have no understanding of time and who enjoy their life as it is and cherish every minute. The same goes for animals, winery dogs in this occasion.  These creatures have the ability to enjoy the very moment, something we often forget in the modern day. Children are our future, of course, and a part of this heritage that we should pass on and on for generations. It is important for me that children are close to nature, close to earth, that they see how everything is born and when life comes to an end. Culture and tradition are passed on from generation to generation for thousands of years in this territory of Chianti. It was important to show all this in our video to again send the message that is depicted on our labels and carried on in our wines – it is our mission to carry on this tradition as close possible and as natural as possible. 4) What was it like filming the winery over an entire year? Can you share any good stories? Well, since there are four seasons in winemaking, it needed to be filmed during all those four seasons and, so, this was a long ordeal which took us a year to realise. We unexpectedly had so much material that it also took us a lot of editing since we initially wanted to do a 1.30 min video. But it was just a shame to leave all that material out, so it came down to do a lot of cutting. Furthermore, it was hard to film in rain or, rather, it was very hard to catch rain on video since the person that was filming only had a few days to work each time. Of course, it was impossible to order rain LOL during those days, as well. I have to say, that we had a lot of luck with various seasons and fortunately we always got the weather we needed. Believe it or not, on the day we were supposed to film the harvest of olives, we had a miscommunication with the video person and he almost didn’t come at all. 5) What is the key message you want to communicate to people about Montemaggio? Sit back with a glass of wine, preferably from Fattoria di Montemaggio ;-), watch the video and let your imagination flow. Want to see more? Join our e-newsletter for harvest dates, wine tips, recipes, special events at Montemaggio and other Italian comforts. Please gives us your feedback in a comment. We want to hear from you!